Structure My Deal tools are complete — you're ready to visit BARNES CROSSING MITSUBISHI! Want to save money with your vehicle? Then you possibly want to get into car that doesn't have the same monthly cost. Refinancing can certainly help with making smaller monthly payments when you're trying to own your vehicle. However, if you think that you have negative equity, meaning that you're upside-down in your vehicle, you may want to trade-in to avoid paying on a bad investment. With positive equity, you can do almost any kind of trade and get a better car. 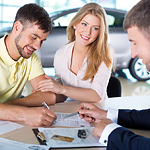 You can trade in with positive equity to get a new car or even sell your car to cash in on its value. Refinancing a car may also be a good idea with positive equity because of how much money you could potential save with a lower interest rate. Want to see all of your options? Stop by Barnes Crossing Mitsubishi for more options with your next vehicle.